(1) DOCTOR WHO SPECIAL AIRS TOMORROW. And you can preview the New Year’s Day Special Doctor Who: Resolution. The Doctor Who cast talk about what to expect in the New Years Day Special, Doctor Who: Resolution. (2) THE YEAR’S MOST WTF. ScienceFiction.com is right – there were plenty: “The Most WTF Moments Of 2018”. There were a lot of memorable moments in pop culture in 2018, including many highs, as well as a few lows. But in addition to that, there were a few events that were just weird or shocking, to the point that some folks are still reeling months later. Yes, there were many deaths. There were also a large number of sexual misconduct accusations. But omitting those, here are a few other moments that you may recall. This was a hard year. For many of us, 2018 was surreal, and for many more, it was deeply painful. But in the face of adversity, as always, it is the women who made us feel we can survive, thrive, and make a difference. In 2018, women like Christine Blasey Ford stood firm against a wave of screams attempting to silence, dismiss and discredit her. But firm she stood. For better or worse, and still experiencing attacks and threats, she and so many other women reminded us that we are strong. Often because the world has given us no choice. But it’s what these women do with that strength that is empowering, inspiring, and life-changing for those of us their lives touch. The genre world is no different. This year, we were still told, constantly and from people who should know better, that there is simply not room at the table for us, or, possibly worse, gaslit into believing there aren’t enough of us capable or even willing to do the work men are handed with far less experience. These women inspired us to say “f*ck that” and be everything the world says we can’t be. And we are eternally grateful. (4) GOING TO HAVE TO REFILL THE MIRROR. A.V. News says “Bandersnatch was so complex that season five of Black Mirror has been delayed”. We never would’ve guessed this, but it turns out that developing an interactive movie with tons of branching paths and alternate endings is kind of difficult. Perhaps that’s why most movies only have the one narrative and end the same way no matter how many times you watch it? …The movie has so many different variations based on what choices you make that Brooker (the creator of Black Mirror) says he has “forgotten” how many different endings there are, going so far as to reject producer Annabel Jones’ claim in a Hollywood Reporter interview that there are five “definitive” conclusions. That Hollywood Reporter piece goes deep into how Bandersnatch was made and some of the behind-the-scenes magic that allows it to work, but the biggest reveal is that Bandersnatch required such an “enormous” amount of time and work that the fifth season of the oppressively dark sci-fi horror series has been delayed…. (5) NEW BUHLERT POSTS. Galactic Journey has published Cora Buhlert’s review of Andre Norton’s Ordeal in Otherwhere (her first Norton), as well her original 1960s recipe for spaceman’s punch, a New Year’s party favorite. Cora also has a poem in Issue eleven of the poetry webzine Umbel & Panicle, out today, which also features photographs by Paul Weimer and Elizabeth Fitzgerald. In Caroline Eriksson’s family, it has always been a tradition to build gingerbread houses. But over the years, Caroline began to get tired of “just” building houses. 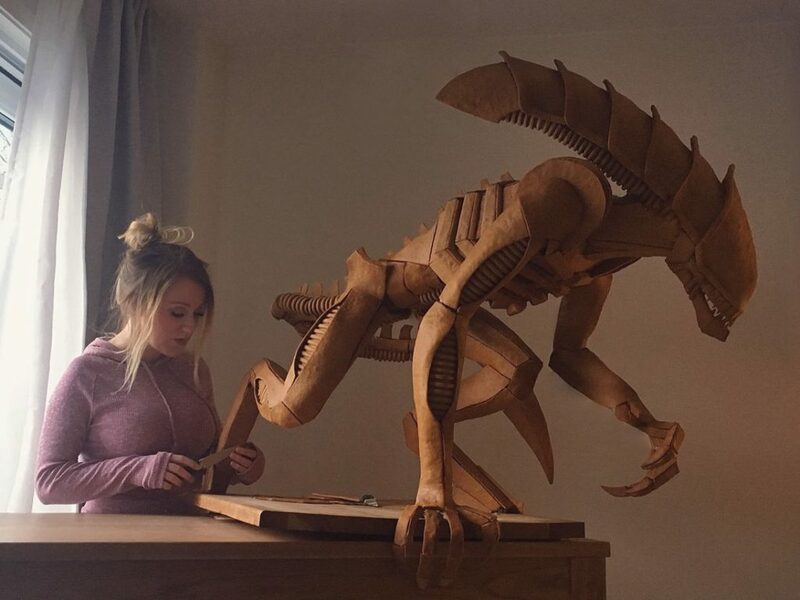 This year she has built a 130×90 centimeter replica of Alien – made in gingerbread. For three and a half weeks, Caroline Eriksson, 31, has worked with the gingerbread during evenings and weekends. Building gingerbread houses always used to be a tradition in Caroline’s family during her childhood in Tyresö. But in recent years, the gingerbread cookies have become increasingly advanced. – After a few years I got tired of doing houses and started to do more special things like boats and some movie creations, says Caroline. For several years, Caroline has lived in Oslo. In 2013, she participated in a gingerbread competition in Norway and since then the gingerbread cookies have become more extreme. – Then I built Optimus Prime, the transformer robot, in gingerbread. I won the competition which was super cool and after that, the tradition of making a gingerbread figure every year continued. I try to challenge myself and make more crazy creations every year, says Caroline. (7) SIR JULIUS VOGEL AWARDS YEAR KICKS OFF. Nominations are now being accepted for the 2019 Sir Julius Vogel Awards, and will be taken until the window closes on March 30, 2019. The awards recognise excellence and achievement in science fiction, fantasy, or horror works created by New Zealanders and New Zealand residents, and first published or released in the 2018 calendar year. …Anyone can make a nomination and it is free! Get busy reading NZ authors and watching NZ movies to find work to nominate. The awards will be presented at Geysercon – the 2019 National SF&F Convention. (8) AMONG THE RUINS. Harvard Gazette’s ‘Stepping inside a dead star” offers “A virtual reality experience of being inside an exploded star.” You’ll need the VR hardware to try this out. Cassiopeia A, the youngest known supernova remnant in the Milky Way, is the remains of a star that exploded almost 400 years ago. The star was approximately 15 to 20 times the mass of our sun and sat in the Cassiopeia constellation, almost 11,000 light-years from earth. Though stunningly distant, it’s now possible to step inside a virtual-reality (VR) depiction of what followed that explosion. A team led by Kimberly Kowal Arcand from the Harvard-Smithsonian Center for Astrophysics (CfA) and the Center for Computation and Visualization at Brown University has made it possible for astronomers, astrophysicists, space enthusiasts, and the simply curious to experience what it’s like inside a dead star. Their efforts are described in a recent paper in Communicating Astronomy with the Public. The VR project — believed to be the first of its kind, using X-ray data from NASA’s Chandra X-ray Observatory mission (which is headquartered at CfA), infrared data from the Spitzer Space Telescope, and optical data from other telescopes — adds new layers of understanding to one of the most famous and widely studied objects in the sky. (9) ROMAN OBIT. NPR reports: “Nancy Grace Roman, ‘Mother Of Hubble’ Space Telescope, Has Died, At Age 93”. She defied a guidance counselor who asked “what lady would take math instead of Latin”; joined NASA when it was 6 months old. When Nancy Grace Roman was a child, her favorite object to draw was the moon. Her mother used to take her on walks under the nighttime sky and show her constellations, or point out the colorful swirls of the aurora. Roman loved to look up at the stars and imagine. Eventually, her passion for stargazing blossomed into a career as a renowned astronomer. Roman was one of the first female executives at NASA, where she served as the agency’s first chief of astronomy. Known as the “Mother of Hubble,” for her role in making the Hubble Space Telescope a reality, Roman worked at NASA for nearly two decades. She died on Dec. 25 at the age of 93. Don Lusk, longtime Disney animator and Hanna-Barbera director, has died. The multi-hyphenate artist behind dozens of iconic characters roaming throughout animation was 105. His longevity was only matched by his output, as Lusk’s six decade career saw him make the faces of Alice in Wonderland, Charlie Brown, Babar, Papa Smurf, and Goofy familiar to an entire culture. December 31, 1958 — The Crawling Eye showed up at the drive-in. December 31, 1958 — The Strange World Of Planet X made for a good double bill at the drive-in. December 31, 1961 — The Phantom Planet appeared in theaters. Born December 31, 1937 — Anthony Hopkins, 80. I never know what I’ve going to find when I look these Birthday possibilities so imagine my surprise when I discover his first genre role was Ian McCandless in Freejack followed soon by playing Helsing in Bram Stoker’s Dracula! He went to have a number of genre roles including being C. S. Lewis in Shadowlands, the lead in The Mask of Zorro, the narrator of that stink, stank, stunk How the Grinch Stole Christmas and Odin in three Thor MCU films. Born December 31, 1943 – Ben Kingsley, 75. First SF character he played was Avatar in Slipstream, later roles included Dr. John Watson in Without a Clue, Minister Templeton in Photographing Fairies, The Great Zamboni In Spooky House, Specialist in A.I., Man in the Yellow Suit in Tuck Everlasting, Merenkahre in Night at the Museum: Secret of the Tomb and that’s just a partial listing. God he’s had an impressive genre history! Born December 31, 1945 – Connie Willis, 73. She has won eleven Hugo Awards and seven Nebula Awards for her work, a feat that impresses even I who isn’t generally impressed as you know by Awards! Of her works, I’m most pleased by To Say Nothing of the Dog, Doomsday Book and Bellwether, an offbeat novel look at chaos theory. I’ve not read enough of her shorter work to give an informed opinion of it, so do tell me what’s good there. Born December 31, 1949 – Ellen Datlow, 69. Let’s get start this Birthday note by saying I own a complete set of The Year’s Best Fantasy & Horror which, yes , I know, it was titled The Year’s Best Fantasy for the first year. And I still read stories for them from time to time. If that was all she had done, she’d have been one of our all-time anthologists but she also, again with Terri Windling, did the Fairy Tale and Mythic Fiction series, both of which I highly recommend. On her own, she has the ongoing Best Horror of Year, now a decade old, and the Tor.com anthologies which I’ve not read but I assume collect the fiction from the site. Speaking of Tor.com, she’s an editor, something she’s also done at Nightmare Magazine, Omni, the hard copy magazine and online, Sci Fiction webzine and Subterranean Magazine. Born December 31, 1958 – Bebe Neuwirth, 60. Ok she’s had but one television SF credit to her name which is playing a character named Lanel in the “First Contact” episode of the Next Gen series during season four but I found a delightful genre credential for her. From April 2010 to December 2011, she was Morticia Addams in the Broadway production of The Addams Family musical! The show itself is apparently still ongoing. Born December 31, 1959 – Val Kilmer, 59. Lead role in Batman Forever where I fought he did a decent job, Madmartigan in Willow, Montgomery in The Island of Dr. Moreau, voiced both Moses and God in The Prince of Egypt, uncredited role as El Cabillo in George and the Dragon and voiced KITT in the reboot of Knight Rider. In this Brewster Rockit, Cliff Clewless may have the right idea—retroactive New Year resolutions. Double Jeopardy Answer, for $3,000: He wrote 1899’s “Father Goose”; he came up with a “Wonderful” adventure the following year. Correct question: Who is L. Frank Baum? Gur FS-nqwnprag nfcrpg: Cuvyyvcf jnf n thrfg (TbU, creuncf) ng ng yrnfg bar FS pbairagvba — ZvavPba? And that’s the name of that tune! (16) KSR’S LATEST. Vidvuds Veldavs totes up the pluses and minuses about Kim Stanley Robinson’s Red Moon for readers at The Space Review. Kim Stanley Robinson’s latest novel, Red Moon, is set in 2047. China has become the dominant player on the Moon with large-scale operations at the South Pole. The US and other players have facilities at the North Pole. China achieved this position using the experience of massive infrastructure projects to mount an operation possibly larger and more intensive in scope than the U.S. Apollo project. According to the novel, President Xi Jinping secured the commitment of the Chinese Communist Party at the 20th People’s Congress in 2022 to the goal “… that the moon should be a place for Chinese development, as one part of the Chinese Dream.” Insofar as 2022 is still more than three years into the future, Robinson may be advocating for such a future. Xi Jinping is highly praised in the book for his Moon declaration as well as for the environmental cleanup that takes place on Earth. The hills surrounding Beijing in 2047 are green and the air is fresh and breathable as a result of the environmental policies of Xi. (17) A DIFFERENT KIND OF YEAR IN NEWS. The BBC’s “2018 in news: The alternative end-of-the-year awards” features videos of masterfully-incompetent criminals, and of an attempt to stifle press questions that got shown up by a phone app. (18) YOUNG JUSTICE. The final trailer of Young Justice Season 3: Outsiders has been released. The TV series will premiere January 4.